There's so much to remember when you go on holiday that you can feel stressed out by it all. So take a deep breath, consult the holiday checklist and think about whether you've got all the following covered. You'll probably find that you have, and you can sit back and wait for the holiday departure date to arrive, safe in the knowledge that you are totally organised! What are The Essential Travel Documents? Passport - obviously! Not just essential for getting in and out of the country, but useful for proof of ID. Check that it's going to be valid for the duration of the holiday - and check the requirements of the country you're going to as some countries need it to be valid for at least another six months. 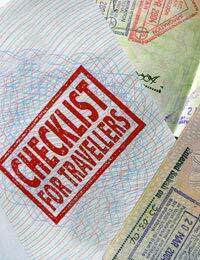 Check which visas you need, how long they are valid for, and what the conditions are. Take copies of your passports, visas and any documents. Keep a record of passport numbers, dates and places of issue, as well as your travel insurance policy details and any help line numbers in case of emergency. If you're going to an EU country, get a Form EHIC from the Post Office, complete it and have it stamped. This gives you free and/or reduced cost medical care if you're taken ill abroad. Make sure you've had all the correct vaccinations at least six weeks before you go. Keep essential medication in your hand luggage, and carry a spare prescription for any necessary medication in a separate bag. Most of Europe now uses Euros. If you're going to the US take travellers cheques in Dollars, which are also advisable for Eastern Europe, Latin America and the Caribbean. Make sure you have enough currency for the country you're visiting to cover emergencies. If you can, try and take cash, travellers cheques and cards so that you don't have to rely on one option. Check the expiry dates on credit and debit cards before you leave and renew them where possible. If your next payment date falls while you're away, make a payment before you go...you don't want to run into problems when you're abroad. Let your card issuer know that you're going to be taking the card abroad, before you travel. Your spending might be picked up by automated fraud programs, and your card could be stopped. Make sure the card is accepted in the country you are visiting, too. Make a note of debit and credit card company emergency telephone numbers, and report lost or stolen cards to your card issuer straight away. Remember that travel insurance policies only pay out for stolen cash if is taken from a safe, so use the safe in your room if there is one, or ask to use the hotel safe. Start packing well before you need to leave, and you can add things to the bag as you think of them. Make a list of everything you need to take with you, crossing items off the list as you pack them. Wrap your shoes in plastic bags so that they don't leave any marks on clothes. Make sure that all of your toiletries are sealed securely, preferably in sealable plastic bags. Keep all valuables in your hand luggage. Carry a spare set of underwear in your hand luggage too, just in case your luggage gets lost or delayed. An emergency mini sewing kit. Now you're all packed and ready to go, you can relax and enjoy your holiday! Taking the Children on Holiday: What are Your Rights?